"The real heroes are the Jane Does who are courageously pursuing this, and who motivate us. It’s not just happening in the Philippines. It’s happening here, in every strata." "‘I Am Jane Doe’ may be the rare social-issue documentary that has an effect on a social issue." "a viscerally emotional case for a common-sense reassessment of the law…’I Am Jane Doe’ offers a gut-wrenching reminder that there are certain rocks we ignore at our peril." 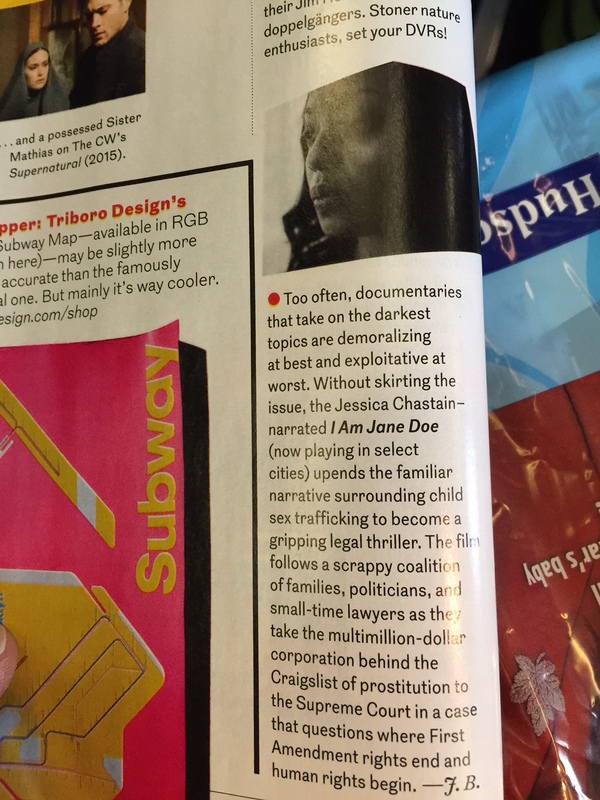 "Mary Mazzio’s documentary ‘I Am Jane Doe’ is a whirlwind primer on the case of Backpage, a classified ads website with a serious problem...a powerful call to action..."
"The movie is Underwater Dreams… Order it now!" - Stephen Colbert, The Colbert Report. Stephen interviews Mary Mazzio and Oscar Vazquez on The Colbert Report. "The awards-worthy “Underwater Dreams” is by turns rousing and heartbreaking, and organically touches on important social issues"
"May be the most politically significant documentary since Waiting for Superman…"
- Jonathan Alter, The Daily Beast. "The year is just half over, but already a contender for best documentary of 2014 is looming with Mary Mazzio’s Underwater Dreams... pulls a breathtaking fast one in its second half, expanding its basic inspirational theme to embrace an even larger message, with an organic efficacy that is nothing short of astonishing." - David Noh, Film Journal. "Moving and insightful… a telling snapshot of our nation’s class and cultural divide." - Gary Goldstein, The Los Angeles Times. "“Underwater Dreams” has a political point of view, shining light on underground Americans who deserve recognition…. starkly reinforces this film's contribution to a continuing dialogue." - David Dewitt, The New York Times. "Obama should arrange for this movie to be shown in every classroom in America. It is the most inspirational, heartwarming film you will ever see…"
"Forget the Blindside, see Ten9Eight"
"I found this film inspiring… it should be compulsory viewing in high schools around the country… what I loved about it was the way the stories are told and how moving it was…"
"very well made piece…If every teenager were as charming, smart, funny and well-spoken as these, the world would be a better place"
"Why You Should Watch Mary Mazzio’s New Documentary… The big takeaway from Mary Mazzio’s powerful new documentary, Ten9Eight, is clear: entrepreneurship skills training for at-risk teens will increase the odds they stay in school." Emotionally, the film packs a wallop..."
"The Apple Pushers could be this year's Waiting for Superman..."
"Mary Mazzio, a filmmaker who documented the stories of several vendors struggling to make a go of it, as well as the political battle to start the Green Cart program in a film titled The Apple Pushers, noted that “seeing these first-time entrepreneurs slowly begin realizing a vision for a better life through the mechanism of a push cart” struck her as a story that “crossed the generations." "In this fascinating and engaging film, writer/director Mary Mazzio takes the viewer into the worlds of pushcarts in New York, immigration, the American dream, nutrition (or lack thereof) in certain neighborhoods and laborious administrative process and shows how those things all converge in the stories of five individuals." "warm and illuminating…told with deftness and emotion…priceless"
"With a mother like his, no wonder Richard Branson became an entrepreneurial dynamo…the film raises critical questions that experts are debating more than ever…"
"The film brings out what can never really be shown on a business spreadsheet." "This is as good as it gets..."